Download this android keyboard, enjoy the free keyboard with cool customized themes, cute emojis? , auto-correction, cool fonts and fast typing! 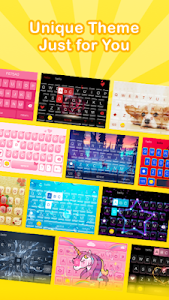 - Countless keyboard themes are available to match your style! - Choose keyboard fonts, tapping effects, and even sound all by yourself! - QWERTY Keyboard, QWERTZ Keyboard and AZERTY Keyboard, all free? to choose! - Create your own custom keyboard in many other ways: turn on or off sound on keypress. 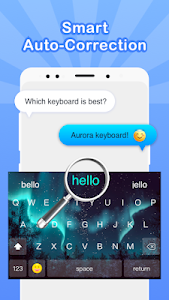 Aurora keyboard helps you create most interesting typing experience. - Don't like the keyboard theme we offer? It doesn't matter! You can personalize your photo theme by simply selecting your favorite photos from the photo gallery and trying and customizing your theme?. - Use your own photos as a keyboard background to change the font, music (sound effects), dynamic effects and keyboard colors. Let you better understand the fun of typing. - Automatically correct the words you are typing and offers you accurate next-word prediction! 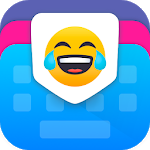 - Offer cute emoji keyboard maker, emoji stickers, funny emojis, custom keyboard, keyboard fonts, cute emoticon, face emojis. 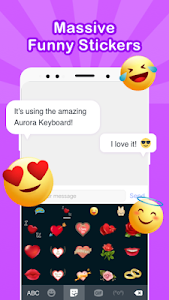 Aurora keyboard offers accurate suggested words & emoticon, making type faster! 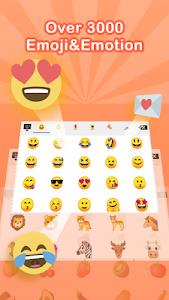 - 1200+ emoji, stickers, GIFs and emoticons in Aurora keyboard to express all kinds of feelings. 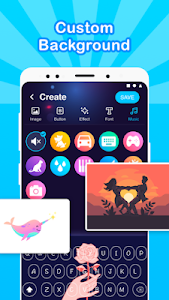 - You can choose from a variety of trendy filters including cute bunny, smile emojis, Doge, etc. - Font keyboard: Cool fonts based on Unicode and auto-correct typos. - Multilingual cool keyboard for Android keyboard. More themes, fonts, emojis, emoticons, stickers and exciting features will be introduced in upcoming updates.